I have a 15 inch laptop that I used to bring whenever I go to college, however, I recently purchased this ASUS Asus C300ma-edu Chromebook to be an alternative. I decided on a Chromebook because I am using Google’s productivity apps like Google docs, drives, sheets, etc, it’s just the perfect OS to run these apps daily. Bought it here since it’s less. Every day, since I purchased it a few weeks ago, I always have this Chromebook in my class, and haven’t found big complains about it. I will try going through for the bad and the good. The bad: this operating system won’t run any Microsoft programs, like MS Office, Skype, or iTunes, because it’s a web based OS. But this is not the device’s fault, the OS is definitely not for everyone. For the unit itself, it doesn’t have a backlit keyboard and it doesn’t have an IPS screen, but for this price, you wouldn’t have a Macbook screen. Now the good: I am still extremely happy with this Chromebook, because it does its job good enough, including printing. It tooks about 1 or 2 seconds to load websites while browsing for me, sure you will be able to find another Chromebook with faster performance but this Asus C300ma-edu is still fast to me. Haven’t noticed any lags or stuttering with a few tabs opened in my browser, watching YouTube videos while listening music or editing my files on Google docs, didn’t experience bad lags or stuttering. Of course, I don’t recommend you to open 10+ tabs on your browser all at once! The screen is a TN screen (no IPS) with 1366×768 resolution, sure, not comparable with a 1080 full HD screen or IPS display, but I knew what I get before deciding it, so I am still positively surprised about the quality of the screen. And you will still get a 1080 quality when you connect this device to a TV with its HDMI port. It’s a matte screen and with the right angle, you will get best view of your screen. And because this Asus C300ma-edu has no fan or fanless, this device is very silent! There will be no noise while it’s running, apart of your keyboard noise and mousepad while you’re using them. And it doesn’t get any hot whenever I use it on my lap. 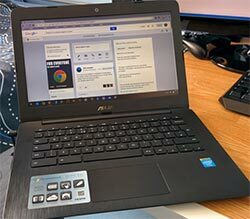 I just love the fanless laptop, it’s so quite to use and very nice to use especially when you don’t want to wake everyone up in the early morning while you are browsing the internet. No IPS but best battery life! Now Asus C300ma-edu with 4GB ofr 2GB RAM? If you have more budget, I will definitely always pick the one with a 4GB of RAM since Chromebooks memory cannot be upgraded, the more memory you have the more snappier your device will run. 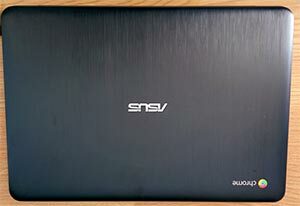 This Asus C300ma-edu vs Toshiba CB30 or CB 35 vs Samsung Chromebook 2? Toshiba Chromebook CB30/35 has Haswell processor, which is faster of these 3, but I heard it has weird trackpad and not really nice build quality. The Samsung CB2 has the slowest processor (Exynos 5800) and the shortest battery life, but it has the best look and it has FHD screen (stull a TN screen). Click here for the full comparison. So if superior trackpad and keyboard, fanless (quiet and cool), longest battery life (10-11 hours), and a 13-inch screen instead of 11 inch are your concern then this Asus C300ma-edu is the best choice of its competitors, and to me it was obvious, battery life of a laptop is very important. And this CB has it.